A 10 minute exfoliating mask inspired by nature to reveal your best skin. Formulated with natural pumpkin enzymes, AHAs and glycolic acid to improve skin clarity. This mask smells and looks just like pumpkin pie filling too! It's a customer favorite for good reason! Ever use acne creams that are so harsh it can even bleach your towels and pillow case? Yikes! It might do more damage than good for your skin! Try this mask out instead and never look back! Even if you don't have acne, this mask will be great for exfoliating, softening, brightening, and toning skin! The pumpkin enzyme mask exfoliates skin without harsh scrubbing. Made with a blend of raw pumpkin, lemon, orange, glycolic acid, bilberry fruit extract, and ginger root to deliver beneficial renewing and radiance boosting ingredients directly to skin. Vitamin C and Beta Carotene increases skin firmness and reduces appearance of fine lines. When you apply this pumpkin pie textured mask on, expect to feel a tingle! This is normal and that’s just the enzymes doing it’s job to remove surface dead skin cells for improved skin tone and clarity. When you rinse the mask off, skin should look soft and refreshed without irritation. The pumpkin enzyme masque is made Fresh to order and ships worldwide! Skincare Tip - Use mask 3 times a week, or move to once a week to maintain results. Can be used more often if your skin tolerates well! Avoid sun exposure or wear SPF while using this product. Vegan and Cruelty Free - All products are tested by the Banish Team on ourselves, NOT on animals! Organic Ingredients-You can pronounce our ingredients! After 1 week of the pumpkin enzyme mask, charcoal mask, and vitamin c elixir. Spread thin layer on face and let dry. Wash off when dried. Usually takes about 10-15 minutes. Mild tingling sensation within the first minute or two of applying the mask is normal. If excessive stinging or irritation occurs, rinse off with cool water. Use 2-3 times a week or as often as needed. Ingredients: Pumpkin Fruit, Organic Bilberry Fruit Extract, Organic Sugar Cane Extract, Organic Orange Peel Extract, Organic Lemon Peel Extract, Glycerin, Tetrasodium EDTA, Vitamin E, Phenoxyethanol, Meadowfoam Seed Oil, Xanthan Gum, Vitamin C, Glycolic Acid, Neem Seed Oil, Rosemary Leaf Extract, Cinnamon Bark Powder, Ginger Root Powder, Nutmeg Powder. Over the years Ive developed bad acne scars and pimples and textured skin. The pumpkin enzyme mask is every but worth it! After a few days I noticed immediate results. Its like the only thing that works for me Love this mask! 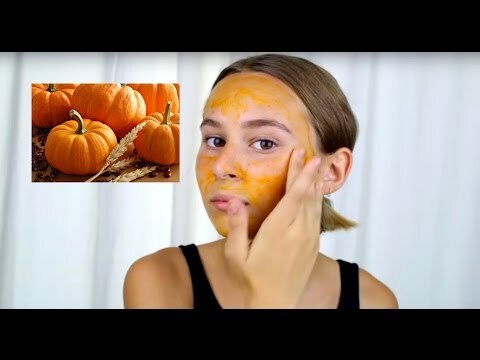 Loving this pumpkin enzyme mask! It has helped reduce my acne! I use it 2 times a week for 15 to 20 minutes and it has made wonders! The mask smells good but it’s not an overwhelming smell, which I personally like. When you put it on you can feel a tingling sensation which I like because I feel it’s working! When I rinse the mask off my skins feels so soft and fresh. This is a great product, I definitely recommend this pumpkin enzyme mask! I love this mask on days my skin is feeling dry and congested, it helps exfoliate like no other mask and leaves my skin feeling brand new!